New Zealand cruises go to so many varied destinations that it is virtually impossible to rank them on a top ten list. People choose to go on mini tours, week long excursions or spend months at sea exploring the great world in which we live. Here, then, is just a sampling of the many, many cruises that you can take from the pretty ports in New Zealand. Cruises to Australia and New Zealand are great ways to see the many different towns and cities that dot the coastline in both countries. Some are mini-getaways that just putter around in the ocean while others go from one country to the other or invite you aboard for a week or two to mosey on a round-trip taking in all the sights that are offered. New Zealand cruises also sail to the many fantastic ports in the South Pacific. Places like New Caledonia, Mystery Island, Port Douglas, Whitsunday Island and Cairns, to name but a few. If International sailing is on the agenda, cruise from New Zealand to places far afield like Hawaii, New York, London or Los Angeles. With multiple stops on each trip, you can get a great taste of the many cultures, attitudes and places of interest that countries have to offer. Indonesian Odyssey tours cruise from Auckland and other ports as well and take you to the wonders that are awaiting you in places like Darwin, Benoa, Thursday Island and Singapore. Grand Voyage cruises travel to many ports of call and even over the International Date Line, en route to exotic locales like Bora Bora and French Polynesia. Travel around New Zealand and stop at all the ports of call along the way, a great way to see the whole country and all of its different cultural destinations on one vacation. New Zealand cruises go to different ports of call in Australia. Whether you want to visit Melbourne, Perth, Sydney or Brisbane, there is a cruise for you, either round-trip or one way. 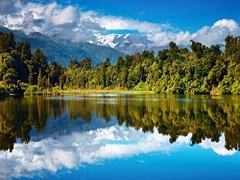 New Zealand adventure tours offer several cruises in and around the New Zealand area. Stay closer to home as you explore beautiful Vanuatu in a 6-night adventure, which features not only diving, but land diving as well. The Islands of Discovery cruises take you to discover nature, partake in Pacific cuisine and swim, snorkel, explore and dream aboard lovely intimate ships. Beautiful Waiheke Island cruises offer 3 nights off the coast of Auckland to explore this popular island and all its charms, both in the water and off. Check online or with your travel agent to see the best New Zealand travel deals for the time you wish to travel, with so much to choose from, picking New Zealand cruises for all your vacation needs is a great place to start.